I’ve met a number of video editors who neglect the audio effects because they don’t know what they do. Or maybe they have dodgy audio they’d like to fix but aren’t sure how to go about it. I always point them towards this article from VashiVisuals, and it’s one I keep coming back to time and time again for its handy tips. It features a number of fixes for common problems using two audio tools every professional NLE has included as standard; the 30-band equalizer (or EQ) and a Parametric EQ. Once music or score is added to the edit, the dialog can get lost in the mix as they both occupy the same sonic space. The first step an amateur takes is to boost the volume of the dialog. Just make it louder right? This is a recipe for disaster as your mix will eventually get out of control and enter into an escalating volume war. Before you boost something…consider cutting something else first. This maxim applies to all EQ philosophies; it is the push and pull of audio mixing. Learn it and live it! So instead of raising the dialog…cut into the music and make a hole for the dialog to live in. 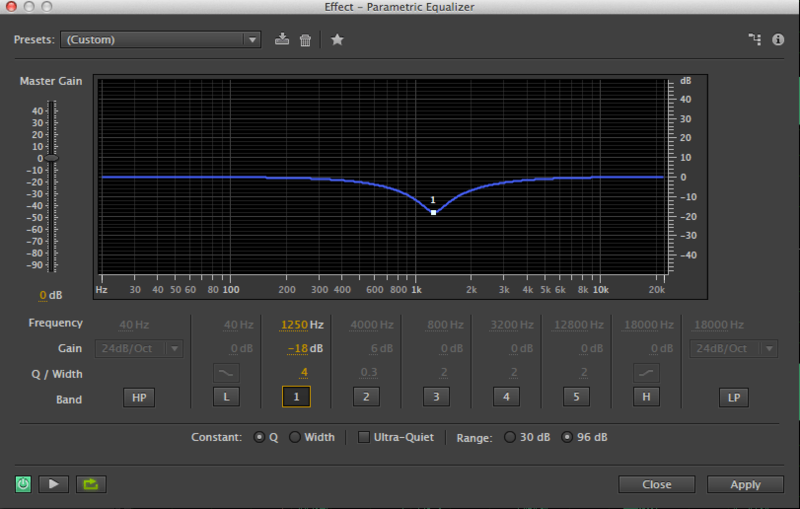 Use the Parametric EQ at 1250hz with -18db and Q=4. This cuts the music frequencies that are in the heart of the human voice range. Notching out and lowering is a much more elegant solution than boosting and avoids the volume Armageddon. This is a great tip that can really help the vocals cut through your overall mix. I’ve found -18dB to be a little extreme though. Even -4dB or -8dB can be enough to give you the room your vocals need. This tip works well for a video where you have many different speakers covering a large portion of the audio frequency spectrum, but let’s say your video has vocals from just one person who has either a very deep or very bright voice. The hole you create at 1250hz may be ineffective, as it’s not creating space at the correct frequency for your vocals. All you’re doing is losing some of your music’s frequencies without helping your vocals to cut through. To fix this, place an effect on the vocals which allows you to monitor the frequency range during playback (like the Multiband Compressor or Mastering effects within Premiere Pro). As the audio plays you will be able to see what frequency range your specific vocals cover. You can then substitute the 1250hz value with the midpoint value of your speaker, thus giving you a more targeted hole in the music. For other tips, including how to save distant and dull audio or make your vocals sound better, check out the full article over at Vashi’s blog.